Create a Princess Party To Remember! It's time for a princess party, so let's introduce your princess to ours! 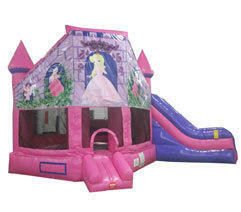 This charming princess castle combo is perfect for entertaing the entire royal court for hours of bouncing and slideing fun. This bounce and slide combo has all the latest safety features with plenty of bounce area. The pink princess bounce house slide combo features decorative and elegant princess castle artwork along with a pink and purple slide. It is guaranteed to be a popular rental item for birthdays, sleepovers, slumber parties and more!